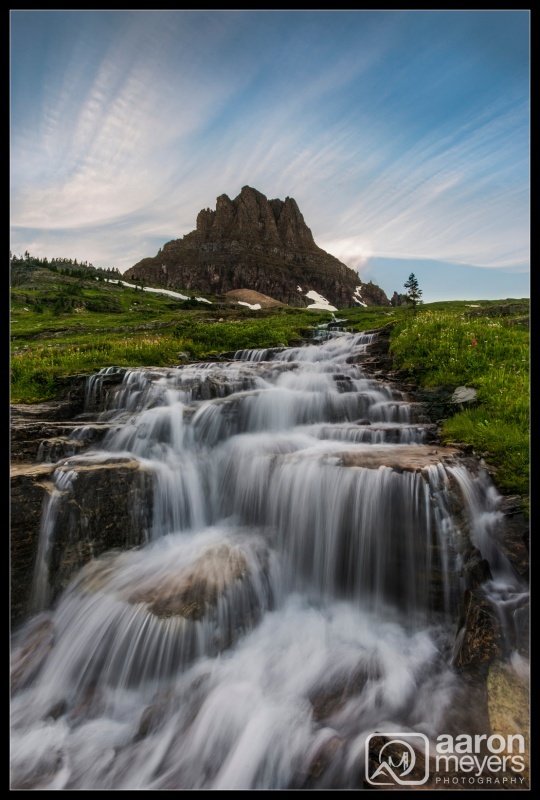 Logan Pass is known for its rivers, streams, and wild flowers. Due to a dry winter the flowers werent in bloom as we had expected. In fact, there were hardly any flowers around. Thanks to 2 days of rain, though, the streams were gushing quite well. Logan Pass sits in between 2 mountains: Mt. Reynolds and Mt. Clements. I find Mt. Clements to be the more photogenic mountain and I knew I wanted to find a waterfall with Mt. Clements in the background. I feel like I hiked around forever trying to find the perfect spot. I found this spot midway through my wandering and when Alan came around and showed me that he had also found this spot, I knew it was where I wanted to be during sunset. I got partially into the stream to get the angle that I wanted on the waterfalls. I then used a 4 image focus stack to ensure sharpness throughout the photo and a 5th photo exposed for the sky. I only wish the clouds here had lit up with some color but I cant complain. It was such a beautiful way to spend the afternoon that I didnt even mind my feet were soaked (I would have felt bad that Alan and Willie had to endure my wet feet but luckily Alans feet were even worse. It wasnt until later on in the trip that I got my shoes so wet they had to be scanned multiple times at the airport).